Most individuals consider their skin as one of their greatest assets. It’s not a surprise since people spend thousands of dollars each year for skin care alone. The skin is not only a part of your body that you can show off, especially if you have nice, even, and smooth skin that’s glowing with health. Another essential function of this largest bodily organ is protection. Our skin shields us from all external elements that could harm our body, including dust and environmental debris, as well as disease-causing bacteria and viruses. Hence, when you notice that your skin is irritated and you don’t know why, then you should get in touch with a dermatologist right away. Remember that once the skin barrier is broken, it becomes easier for microorganisms to enter the body and cause harm. Contact dermatitis is a common skin problem that occurs when the skin comes into contact with substances or things that cause irritation. Examples of common allergens are: fabric, perfumes or fragrances, soaps, plants, as well as metals, like nickel, silver or gold. Aside from these, contact dermatitis can also develop if a person is allergic to certain kinds of topical creams, such as those that contain neomycin, or it can also be due to exposure to pesticides or pest repellent creams or chemicals. Furthermore, some individuals are very sensitive and they can experience burning sensations, rashes and severe itching because of insect bites or due to exposure to allergens, which could include small particles of dead insects or insect excrement that have gotten mixed with common dust. Do I Have Contact Dermatitis? The most common symptoms of contact dermatitis include the following: –The area that directly touched something feels itchy, warm, and sometimes sore to the touch. —Rashes usually form, and these could develop into oozing blisters. –Blisters that have dried could become scaly, crusty or thickened. Because the rashes that occur with contact dermatitis are often mistaken as a result of an allergic reaction, it is very important to first determine what type of rashes you have. If these are because of an allergic response, the rashes or hives will be widespread. Meaning that you won’t only have rashes on the spot where your skin touched the irritant. You’ll also have these in areas that are far from the affected area, and sometimes your entire body could be affected too. The first thing that you have to do is to avoid touching the item or product that you believe caused your skin to become irritated. Then, wash with a mild soap and running water. Apply a cold compress in case blisters form. If the rashes are only found in a small area, apply hydrocortisone cream for relief. 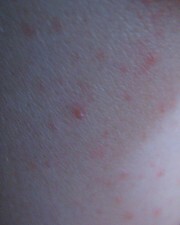 However, go for a check up if the rashes affect a larger area, if these are very itchy, or if the blisters begin to ooze. Avoid slathering on antihistamine creams as these could aggravate the problem. Wait for what your doctor will prescribe. To treat contact dermatitis, dermatologists often give steroids, antihistamines, as well as ointments. Don’t ignore this skin problem because it could worsen. An uncomplicated rash can turn into neurodermatitis, wherein you’ll experience chronic itching and skin scaling. If disregarded, contact dermatitis could lead to more severe bacterial or fungal kin infections too. Claire Brent is a freelancer who often blogs about pest control issues. Her articles often discuss health concerns related to insect infestations, and these materials have been featured in blogs and used by renowned companies, like Preventive Pest Control.